When I am building a solo, say a blues solo in the key of A (e.g. A minor pentatonic? ), do I play in the A scale over the whole progression or do I switch to a D scale then an E scale as the chords change? The short answer is you can do either of those things. Minor pentatonic is one of the most versatile scales you can play. It works over major and minor key blues without having to change the root/starting note of the scale for each chord. It'll also work over most minor key progressions. But there are certain notes that will better emphasise the IV and V chord tones in a I IV V (major or minor) progression. So, Am, the tonic or i or 1 chord, we'd start with A minor pentatonic. So both the chord and scale share the same root and therefore this is the most natural and "resolved" chord to use minor pentatonic over. Moving to Dm, the iv or 4 chord, we're looking for D minor chord tones within A minor pentatonic as our target notes. These are the notes on which we start and end a phrase, or the notes we want to emphasise over the iv chord. Essentially what we're doing is emphasising the 5, b7 and 1 of Dm within the A minor pentatonic pattern. 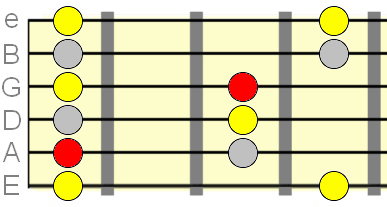 There, we've highlighted the b7, 1, and b3 of Em as these are the Em chord tones that exist within the A minor pentatonic scale. So, whatever the minor key you're playing in, find the root of the minor pentatonic pattern (which should be the same as the root for the i chord) and then use the above note positions within that pattern as target/resting tones for the iv and v chords. That doesn't mean you can ONLY use those tones within the pattern, it just means those are the tones that you will want to emphasise in your soloing phrases over the 4 and 5 chords. It's also worth pointing out that you should never be restricted to minor pentatonic. Try using extensions such as the blues scale (this is simply minor pentatonic with a passing flat 5th tone) to spice up your pentatonic licks. 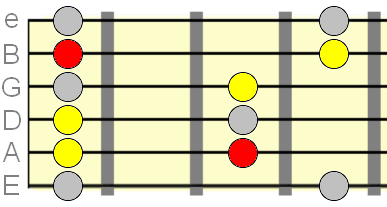 In the above example (where all three chords in the 1 4 5 progression are minor) the common seven note scale choice would be natural minor, so also keep this in mind for coloring the pentatonic sound. Hope that helps. Use the comments link below to ask any further questions.